Our group of 31 traveled to Phillipsburg, New Jersey on a Coach Tours bus out of New York at 8:30 AM and arrived there 90 minutes later. We had enough time to walk over and take pictures from the city’s 1895-vintage Free Bridge linking downtown Phillipsburg with Easton, Pennsylvania. We then boarded an 11 AM steam-powered excursion train south to Carpentersville, New Jersey and back along the Delaware River. Operated by the New York, Susquehanna & Western Technical and Historical Society, the 7-mile trip lasted one hour and 15 minutes. The train was pulled by NYSW No. 142, a 2-8-2 Mikado hand-fired steam locomotive built in 1989 (not a typo) by the TangShan Locomotive Works in China. It was purchased in 1992 from the Valley Railroad in Essex, Connecticut after No. 141 sank in the Indian Ocean on its way to NYS&W. The engine pushed the train back to Phillipsburg as a reverse move, requiring several stop and protect actions by the crew at all roadway grade crossings. The train operated around 25 mph southward and 15 mph northward. Back in Phillipsburg, we photographed the 12:30 PM excursion train’s departure before re-boarding our bus for lunch at the Clinton Station Diner, featuring the Blue Comet open-end heavyweight observation car in which the ERA reserved space. After lunch, we visited Phillipsburg Union Station, hub of the New Jersey Transportation Heritage Center, owned by The Friends of the New Jersey Transportation Heritage Center, Inc. Inactive since 1989, the Prairie style structure is being restored to its original 1914 appearance. So far it sports a new roof, restored exterior brickwork and replastered interior walls. The interior will be restored next. Eventually the lower levels that once led to the station platforms trackside will be restored. 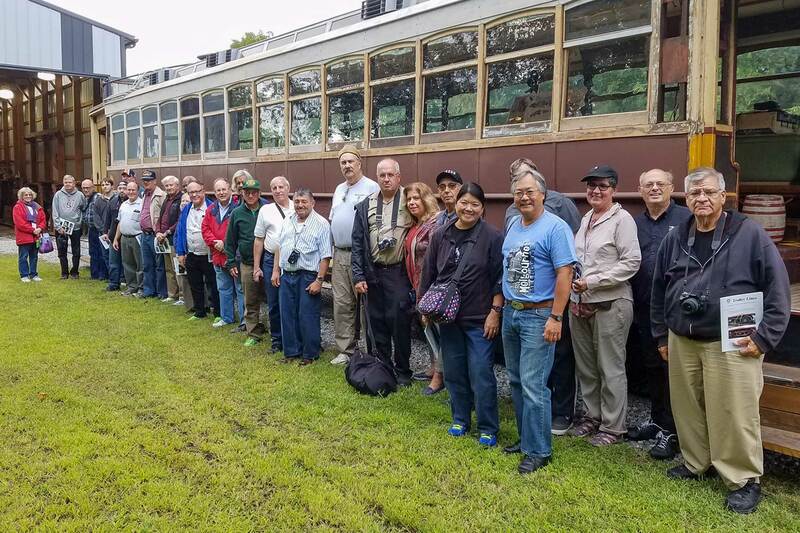 Afterward, our group was taken a short distance to North Jersey Electric Railway Historical Society’s trolley barn housing some work locomotives and equipment. Its star attraction, Public Service Car #2651, once plied the streets of Newark, N.J. This car is in the midst of a major restoration effort including clear glass windows in the clerestory roof, plus woodwork on interior seat benches, walls and surfaces. It is hoped that the entire car will be finished within just a few short years. We were given a ride in #2651 over the 100 feet of track outside of the barn. Power to the car’s traction motors is provided by a generator and a long extension cord linking it to the car. Join us as the ERA concludes the summer with a scenic day trip through New Jersey to visit the Phillipsburg Railroad Historians Museum and take a ride along the Delaware River on a steam train. At lunch time, we will dine (at your own expense) in the open-platform Blue Comet dining car at the Clinton Station Diner, home of the astonishing 50-pound Mt. Olympus Burger. The Delaware River Railroad takes a beautiful route between Phillipsburg, N.J. and Riegelsville, Pa. running a hand-fired steam locomotive built by Tangshan and pulling restored Long Island Rail Road coaches from the 1950s and 1960s. After lunch, we will visit the restored Phillipsburg Union Station and view the North Jersey Electric Railway Historical Society’s restoration of Public Service Car 2651. Our chartered Coach Tours bus will leave promptly at 8:30 AM from the east side of 8th Avenue, just south of West 41st Street, across the street from the Port Authority Bus Terminal. We will make a second stop at Metropark station in Iselin, N.J. at 9 AM It is expected that we will return around 6:30 PM We look forward to seeing you there! Orders are due by August 30, 2017. Book your tickets ASAP! For further information, contact Robert Colorafi using our online contact form.